Bulgarian police took two people into custody outside Sofia’s landmark Alexander Nevsky cathedral on July 1 as tensions rose between rival groups, for and against the visit by the Russian Putin-worshipping Night Wolves motorcycle group. In spite of a large police presence, there was pushing, exchanges of insults and threats between those welcoming the Russians and those who had turned to protest against the biker group which, among other things, has been implicated in support for Russia’s illegal annexation of Crimea. It had been expected that the visit by the Russian motorcyclists would lead to trouble, and city councillors from the Reformist Bloc had appealed to Sofia mayor Yordanka Fandukova to ban the Night Wolves gathering in the capital city. But the municipality said that after consulting security and intelligence services, it had decided to allow the event. At Alexander Nevsky cathedral – the largest Orthodox Christian house of worship in the country, named for Russia’s patron saint – a side entrance was opened to allow the Russian motorcyclists to enter to light candles. Those welcoming the group displayed Soviet hammer-and-sickle flags and Russian flags and chanted “Russia!” – as well as shouting homophobic slogans. Supporters of the Night Wolves included Bulgarian paramilitary groups, some wearing camouflage clothing, from the “Vassil Levski” national union and the “Shipka” Bulgarian National Union. Reporters noted their markedly aggressive behaviour. Opponents of the visit waved Bulgarian, Ukrainian, Nato and European Union flags. Their shouts included “Putin-terrorist!” and “This is not Moscow!”. 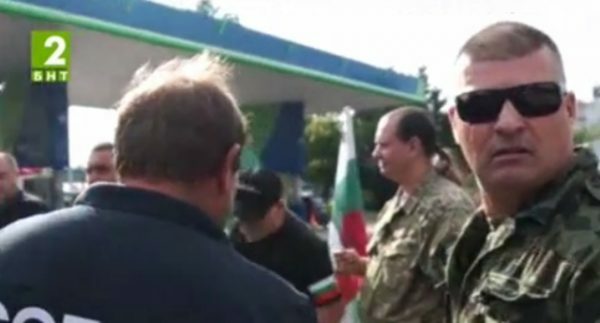 Those objecting to the visit said that they did not want “Putin’s little green men” in Bulgaria (a reference to pro-Russian forces in Ukraine). “The whole world knows what they did in Crimea. This is a free Bulgaria.” If all Bulgarians learnt the true history of Bulgaria, there would be no Russophiles in Bulgaria, opponents of the visit said. There were tensions inside the cathedral as well, through police moved quickly to try to ensure calm. In Bourgas at the Black Sea, following a clash between the pro-Night Wolves paramilitaries and protesters against the motorcycle group, four people appeared in court. They included two from the paramilitary group and two from the Bulgarian and Ukrainian group of protesters against the Night Wolves. In a statement on July 1, responding to numerous media inquiries, Bulgaria’s Foreign Ministry said that the country’s diplomatic missions in Russia had not issued visas to the Night Wolves motorcycle club. The representatives of the club had entered Bulgaria using Schengen visas. They were not on the list of people prohibited from entering the EU, the Foreign Ministry said.